Tagatose is an interesting natural sweetener that is just slightly less sweet than sugar. It has 92% of the sweetness but only 38% of the calories so it is useful as part of a calorie controlled diet. It is a monosaccharide with a simple molecular structure similar to glucose. It has a good taste and a texture similar to sugar. It occurs naturally, but in small quantities in milk, also in certain fruits. It has less than half the calories of sugar. It has a zero glycemic index. This makes it very suitable as part of a diabetic diet. Unlike most sugars it is not harmful to teeth, in fact it has been shown to help prevent damage to teeth. It is also a prebiotic. This means that it assists in the development of beneficial bacteria in the gut. It is also reputed to slow the absorption of glucose into the bloodstream, so it may be of additional use for diabetics in this regard. Although it is not a sugar alcohol it can have a slight laxative effect. The body treats it as a fibre, this can have beneficial effects but can cause cramps etc if consumed in excess. Probably best not to consume more than 50 gm per day. There is no guideline Acceptable Daily Intake set by the FDA, they simply assign a GRAS status. They also mention, worryingly, that in one study, 20gm taken all at one time produced nausea in some volunteers. It is an natural product manufactured using an enzymatic process. It is made from milk. Lactose is concentrated from whey, separated into Glucose and Galactose, and the Galactose is converted into Tagatose. Whey is a by-product of cheese manufacturing. Sweet Smart sell a product called Tagatesse. (Note: Tagatesse also contains a small amount of Sucralose - an artificial sweetener). 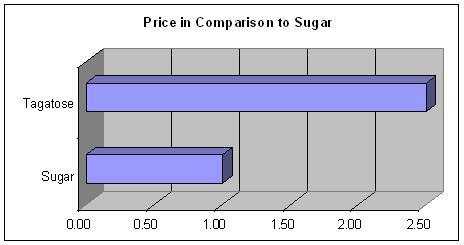 It's about two and a half times the price of cane sugar on the commercial market. Smaller quantities can be bought on Amazon for about $20 for a kilo. Tiny market share. Has not yet taken off as a sweetener so no real data available. Has not yet caught on but could have many potential uses. Like sugar it produces a browning effect (Maillard reaction) if heated. This is useful in cooking, and for making toffee and caramel etc. This makes it suitable as a direct replacement for sugar. It is unusual in that while it is a sugar, the body seems to treat it as a sugar alcohol. It is only partly digested and the remainder is treated as a fibre by the body. Like glucose and fructose it is a monosaccharide with the chemical composition C6H12O6, but because of it's structure the body treats it differently. Like polyols it may cause cramps etc of consumed to excess. Note: Although it is made from Lactose, Tagatose is Lactose free so it does not pose a problem for individuals who are Lactose intolerant. Approved in the USA in 2003. Approved in the EU in 2006. Approved in many other countries. Is useful for diabetics and it is harmless or even beneficial to teeth. It is a natural sweetener but rare in nature. It appears to be totally safe, but best to limit consumption to 50gm per day if cramps experienced. Supposed to be very beneficial as a prebiotic if taken in small quantities.